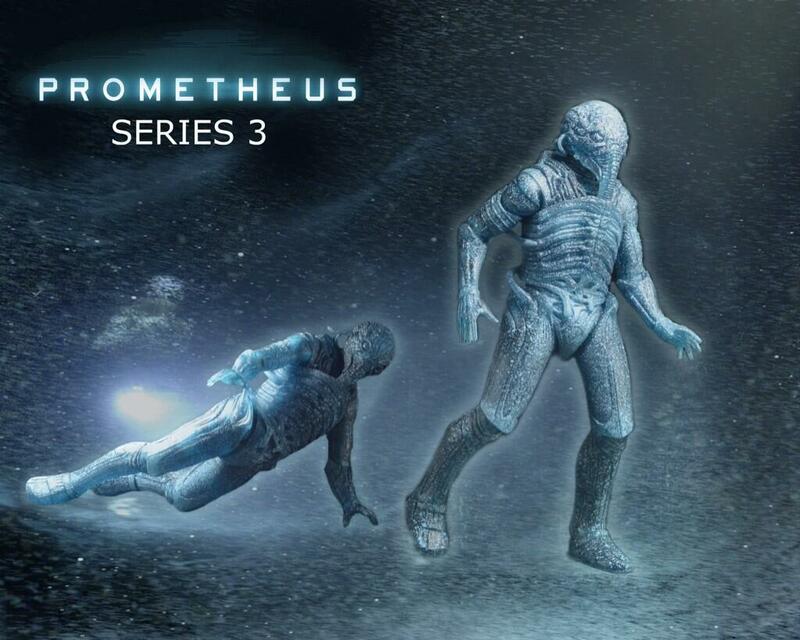 NECA has released this teaser photo for Prometheus Series 3. It appears to be an image of a "holographic" version of the Engineers that the crew of the Prometheus stumbles upon after entering the mysterious structure on moon LV-223. Figure wise this looks to be some sort of a repaint of the "Chair Suit" Engineer (Space Jockey) from series 1, perhaps in a translucent plastic of some kind. Apparently more details will be coming out next week. As a big fan of both the film and NECA's toyline, I'm excited for any Prometheus action figures we can get. I am disappointed, however, that NECA seems to continue citing poor sales of the first two waves to justify not releasing figures of Dr. Elizabeth Shaw and the mutated Fifield, figures the prototypes of which they have already shown at the New York Toy Fair. If all we get are repaints, I'm not sure that holographic Engineers will sell well enough to further expand the line. In my opinion, NECA really should have released character like Shaw and David early in the line along with the basic engineer. Let's hope that part of the surprise is at least one new character (wouldn't mutated Fifeld or most of the male crew members simply be new and such on the suited David body?) and perhaps a few more cool accessories such as David's head. Yeah, that'd be an accessory I could go for.